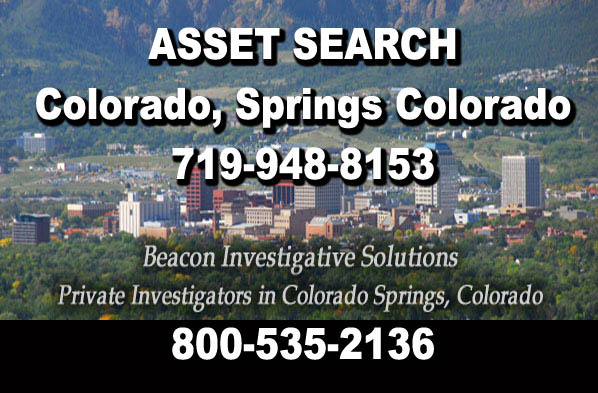 Beacon Investigative Solutions provides comprehensive asset search investigations to customers in Colorado Springs, Colorado, uncovering hidden assets such as bank accounts, stocks and bonds, moneys owed and other assets. Naturally, we follow all applicable Colorado, federal and local laws during our investigations. If you are trying to collect on a judgment, or need to know about a company’s or individual’s assets for any reason, give us a call today so that we can help you with our expert Colorado Springs asset search and discovery investigations. Return to our Colorado Springs Private Investigator page.